This is the first of some accessories posts I'm going to start putting up on my blog. I'm a big fan of quirky and unusual shoes and accessories and within the last year or so I've discovered some amazing brands that make just the sort of accessories I love. I think my love of quirky accessories began when I discovered the shoe brand Irregular Choice. I think I first became aware of them around 10 years ago and I had two pairs of their shoes that I absolutely adored and literally wore until they fell apart! I have had a couple of pairs since but at the moment I can't really afford them and also a lot of their designs feature high heels (at 6ft tall I don't need any extra height) but my boyfriend did buy me a pair for Christmas a couple of years ago that I might feature on the blog shortly. 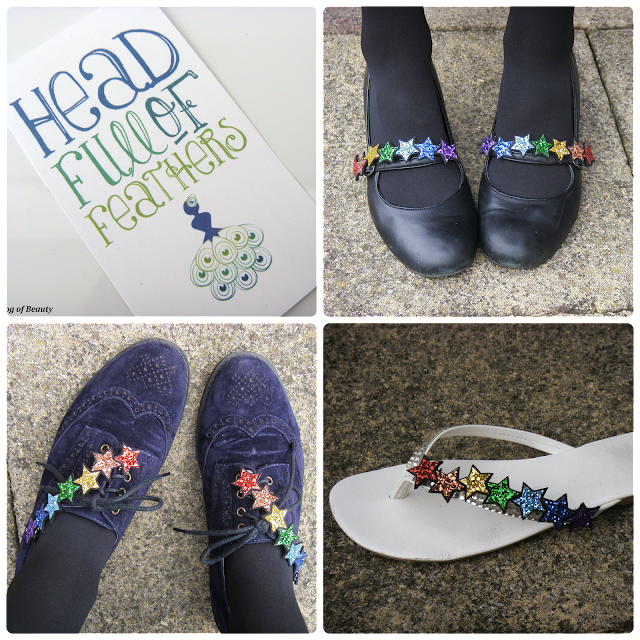 When I attended the Bristol Blogger Meetup earlier this year I met the lovely Jen who has her own accessories business called Head Full of Feathers. Jen very kindly donated a glitter bow hair clip to go in each goody bag (I'll be featuring this on the blog in the future) and as soon as I saw it I knew I would love Jen's other stuff. 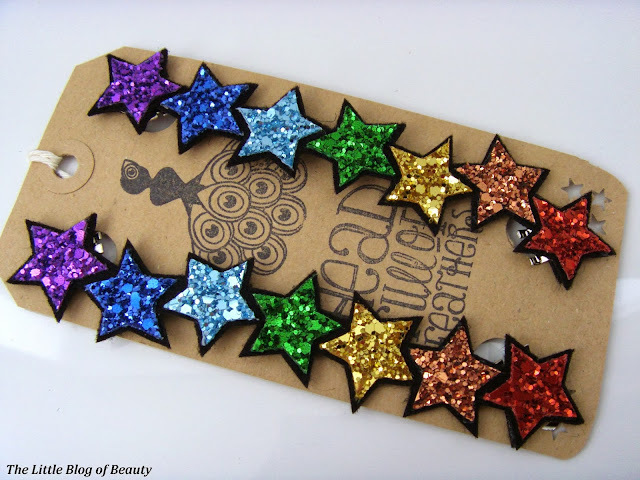 Recently I was chatting to Jen on Twitter about one of her newest items that she had posted a photo of and she very kindly offered to send me some Rainbow stars glitter shoe clips* to feature on my blog. When I got home after filming last week (at 2:20am after 11 hours on set!) I discovered a parcel waiting for me and I squealed with delight when I opened it! 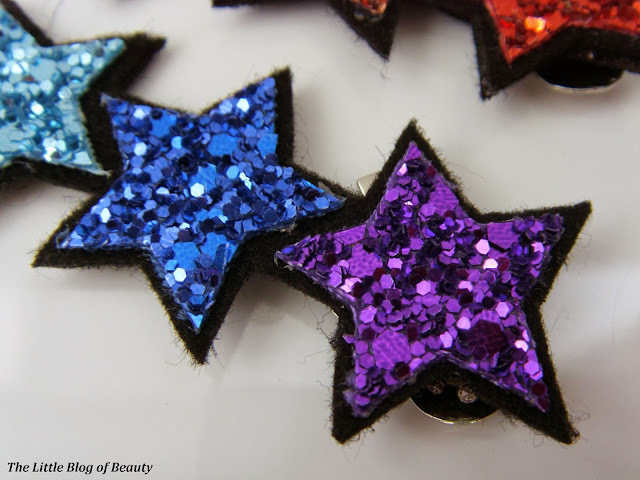 The shoe clips consist of 7 non-shed glitter stars which are felt backed and have a clip on each end. The clips have teeth inside, to grip to whatever you attach them to, but are smooth on the outside so as not irritate your feet. 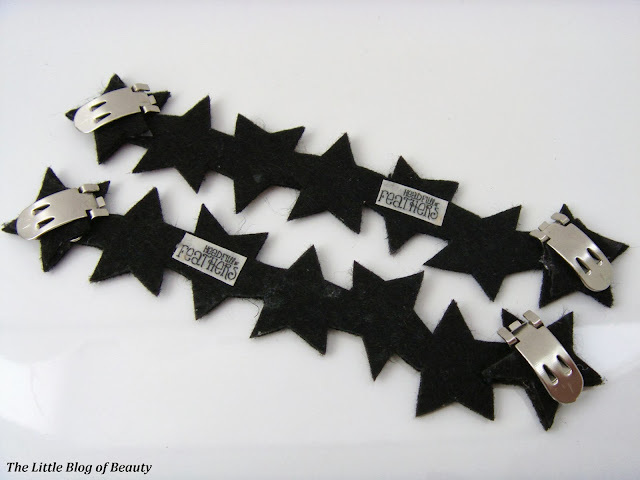 These can be clipped to the shoes themselves, straps, laces or to anything really. 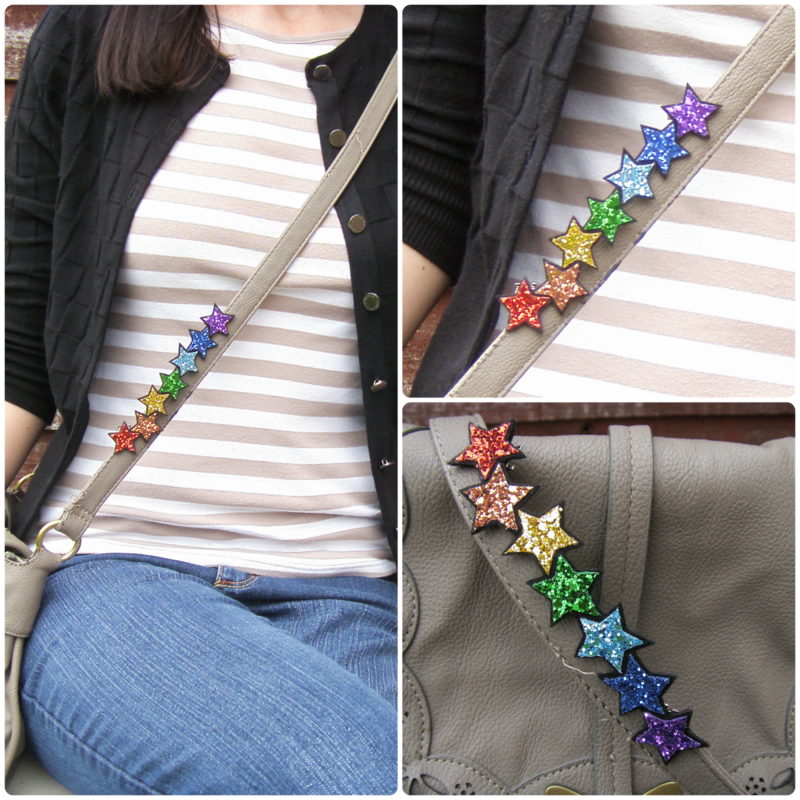 I also tried clipping one onto my bag strap (as shown above), in my hair (you do have to be a little careful with this one) and even suddenly had the idea to try clipping one to the hem of my skirt while I was sat typing this up! You really could put one pretty much anywhere you wanted to. I would have tried clipping one to my new bowler hat but I'm currently waiting for it to arrive. I checked in two H&M stores and couldn't find any so I've had to order online so I'll probably receive it some time in January! 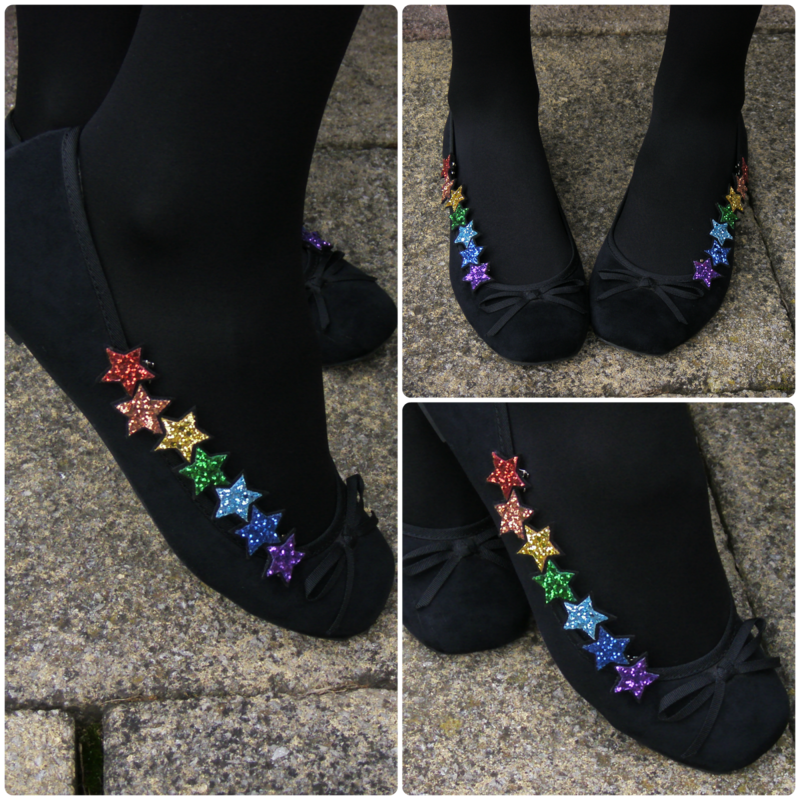 The Rainbow stars glitter shoes clips are £19 for a pair and can be ordered from Head Full of Feathers. 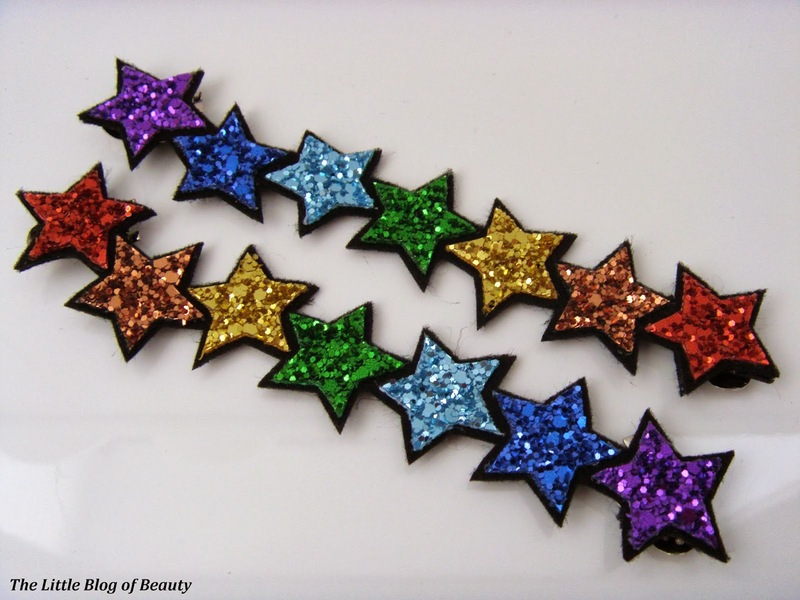 They're also available in pastel rainbow and single colours. I love this! You wear your rainbow clips so well - amazing range of clippy places! Will be passing on your post to all my fans and followers, they will love it! Looking forward to seeing your coming accessory posts AND your irregular choice shoes - I love them too! I want so many of their designs! They are actually so sweet! I love them!! These are adorable, love them on your shoes! These are so cute and what a fab idea, have never heard of shoe clips before! Oh wow these are super cute, never heard of anything like this before!! Halloween nail art - We're watching you!